Today I came back to this. Pushing out all condemnation and fear with every ounce of strength I have. Shoving shame and expectation out of the way and running with all determination to my reserved spot on my Father’s lap. My grandma always likes to tell the story of me around the age of two or three getting out of the church nursery on Sunday mornings after church. She says that I would push and shove without any regards and come straight to her, my nana. I would wrap my arms around her legs and hold on so tight. Every Sunday, this happened. My goal, her legs…and with my vision narrowed in I didn’t let anything stand in my way. I was going to get to my nana. That’s how I feel with God right now. Fear and shame, get out of the way because I know what I am going after and I know who my God is. And I believe that the way my grandma received me, with unspeakable joy and happiness — or as she would say ‘tickled to death’, is how God receives me every time. And by the grace of God I am so anchored in him. I often feel like a distracted little toddler, easily influenced. But maybe I am more like a kite that is attached to a boat which is held by this anchor. Flying around wherever the wind leads me but also directed by the movements of the boat caused by waves. Sometimes it feels like I am not attached at all, and then the string tightens and I remember that I am not alone swirling about with no place to land. But as I explore and discover, I am anchored and settled so deep in his love. 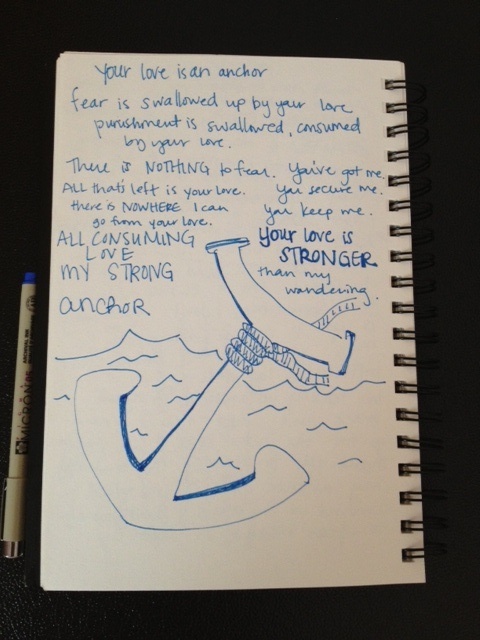 In fact, his love is my anchor. It’s constant, never failing and always trusting. I am secure. I am anchored. And I am free. There is no place that I can go from his love. Hallelujah!